Start out on I-90 West at mile marker 435 (eastern South Dakota)and continue west until you hit mile marker 32 for the first exit into Sturgis, SD. Starting at the eastern end of the state you come over the last risen rolling down toward the Missouri River near Ocoama, SD. The terrain changes from lightly rolling hills, to very extended plains for as far as the eye can see. Past Murdo, SD it changes as you enter the Badlands showing you some of the more rocky cliffs off in the distance either side of the road. Sunrise over the Missouri river morning 6th August. 90 East and West is currently under construction for repaving. It is a fast road with a normal speed limit of 75 miles an hour. The ride was really smooth, and not what I expected with the hard winters they have that far north. The road is pretty flat, with a strong wind constantly blowing knocking you around a good bit. There is a scenic overlook just past Murdo that was pretty good for pictures taking. A view of the open rolling plains heading toward Sturgis on I-90. If you have a small gas tank, you will need to carry a gas can for the trip through the badlands. Just past Chamberlain, SD you will cross the Missouri River. Just past the river you will come to Al's Oasis and Cedar Shores recreation area. They have spaces for motorcycles. If here is rain in the forecast don't pick campsite 14/ 15. Murdo, SD is a good place to stop for gas, and food. It also has the Pioneer Auto Museum. The cost to get in was only $10 but the locals told me it would take about 3 hours to see everything without being rushed. You will also start seeing signs pretty far out talking about Wall Drug Store. In Wall, SD what used to be a small drug store has now turned into a pretty large complex with multiple attractions. Wall is a must stop, especially if you have kids. At the far west end of the road you will come into Rapid City and from there you are very close to multiple destinations. Deadwood, Mount Rushmore, Lead. on November 29, 2011 0 out of 0 members found this review useful. Motorcycle Make Yamaha "Raider" V-Twin, 119 c.i./1900 c.c. Rode this route east from Sturgis back to Alabama. 2009 detoured through the Bad Lands then back on to I-90, 2010 through Sioux Falls, and 2011 turned south onto US Hwy. 83 at Murdo, SD. I had no problems getting fuel with a 150 mile range ride. on September 24, 2009 0 out of 0 members found this review useful. The mileage between gas stops was close to 100 miles in some locations, with the closest off highway stops sometimes as far away as 47 miles. Not terribly helpful if you have a small tank. The really strong headwind can really cut down on you mileage as well. Sometimes the headwind was up as high as 45 - 50 MPH. 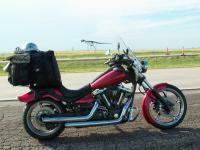 This route was included on this site since it was the first time I ever went to Sturgis, SD. I rode it on my own when my buddy backed out and I was left to find my own way. I would say the views along the route are pretty sweet, but I may be biased. There is no reason to not include an interstate ride since it was amazingly remote, and the best way to get there from North Carolina. I couldn't take more than 3 weeks off to ride this summer, otherwise I would have come up from the south. on September 7, 2009 0 out of 0 members found this review useful. I can't believe somebody would put an interstate highway as a route on this site. I only ride on the interstate when I have to. A ride through the badlands is much more enjoyable. Plenty of places to purchase fuel. How far is between gas stops through the bad lands?